Shine Bright at any Topology. One IC, performing brilliant in various applications. 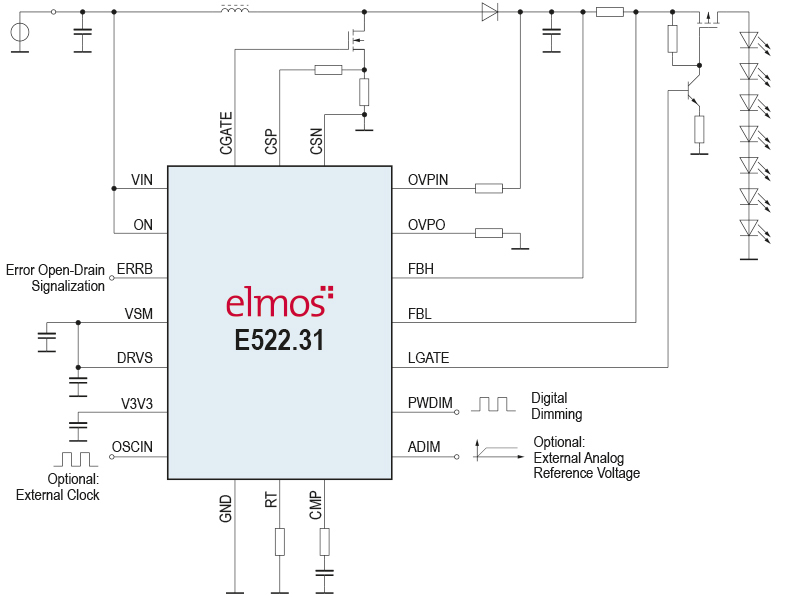 With the E522.3x chips, Elmos introduces an automotive LED controller family. The DC/DC ICs are designed for input voltages between 5V and 55V and output voltages of up to 80V in boost mode. They can be operated – depending on the type – in single or dual LED chain mode. With an ambient temperature range of –40°C to +150°C, the Elmos DC/DC ICs are made especially for use in harsh environments such as automotive conditions. In addition to high robustness, the components offer a great variety in the selection of circuit topologies, such as boost, SEPIC, Buck-Boost and Buck. The switching frequency can be adjusted from 250KHz up to 600KHz by means of an external resistor or synchronized with other components in master-slave configuration. Power consumption in sleep mode is only 8µA. The versatility of the E522.3x controller family is completed by various control and monitoring functions, e.g. protection against short-circuit, overtemperature, overvoltage, undervoltage and load break. The LED controllers support PWM and analog dimming for the LED brightness control, both are working in parallel. The PWM of E522.3x allows a wide dimming ratio of >1000:1 at PWM frequencies of up to 400Hz.